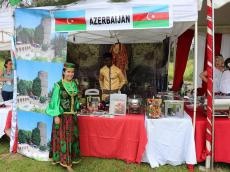 Azerbaijan, India, France, Egypt, Kenya, Senegal, South Africa, Cote D’Ivoire, Ghana, Turkey, Morocco, Nigeria and other countries showcased their rich culture through the unique dressing, cuisine and music at this year’s Banana Island Cultural Festival. Each country represented at the event was assigned a booth to display their, traditional attires, artwork, cuisine and other items. The gorgeous dressed designed by Gulnara Khalilova, the head of the Center of Azerbaijan National Costumes caused great interest among guests of the event. The festival participants also tried samples of national cuisine, including dolma, gutab, pilaf and pakhklava, Trend Life reported. Besides, the national dance composition "Qavalla r?qs" was performed at the event and was greeted with ovations. The Azerbaijani pavilion also featured literature, souvenirs, and other items. The Banana Island Cultural Festival represents a celebration of the diverse nature of the Banana Community. The event brings the residents of Banana Island together in celebration of cultural diversity by showcasing the traditional food, drinks, attire, dance, music and exhibition of historical artifacts. Ambassadors and politicians of different countries, the culture minister of Nigeria and other officials, attended the festival in Lagos, Nigeria.